Owning Up To It Bun Toons! YAY! Your humble lagomorph blogger was asked to contribute a thought or two in comic form about the influence Art had on my Art. It’s all about the gnawing teeth. That’s what makes for a great toon avatar. For last week’s snide, fan-baiting Bun Toon, click here. For Bun Toons from the past…click the Rabbit. 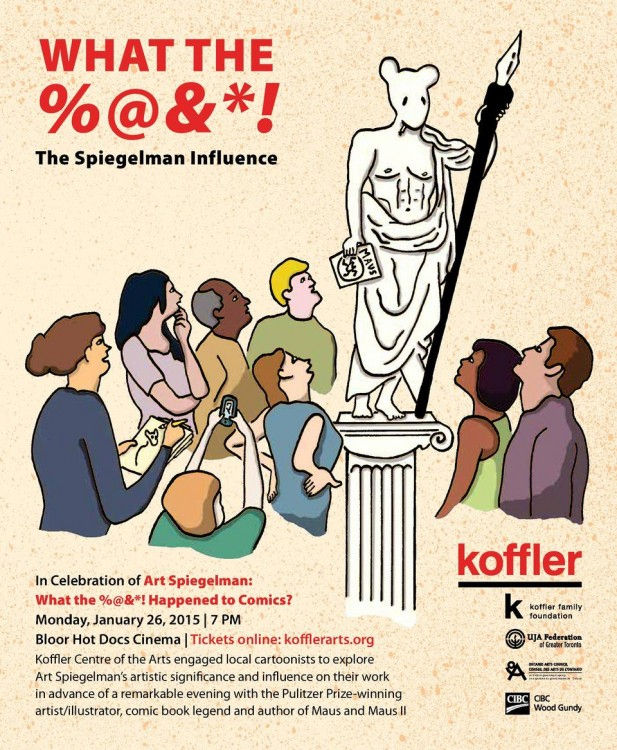 Posted in Art Spiegelman, Koffler Centre of the Arts, Maus, Mouse Rat, Parks and Recreation, What the %@&*! All Canadian Bun Toons, Eh! YAY! You know, other countries have their good points. You can visit Disneyland or the Great Barrier Reef, or Stonehenge when you’re abroad. This is absolutely true, by the way. We suddenly don’t have to pay anyone for the rights to Conan, James Bond, Tarzan, and a whole bunch of great old pulp characters in our fine Dominion of Canada. If only there were enough people in Canada to give us a film industry, I’d be kickstartering this idea tomorrow. As long time readers of the Bun Toon might know, I once dipped my toe in the James Bond universe doing a couple of storyboards for the very short lived animated series James Bond Jr. 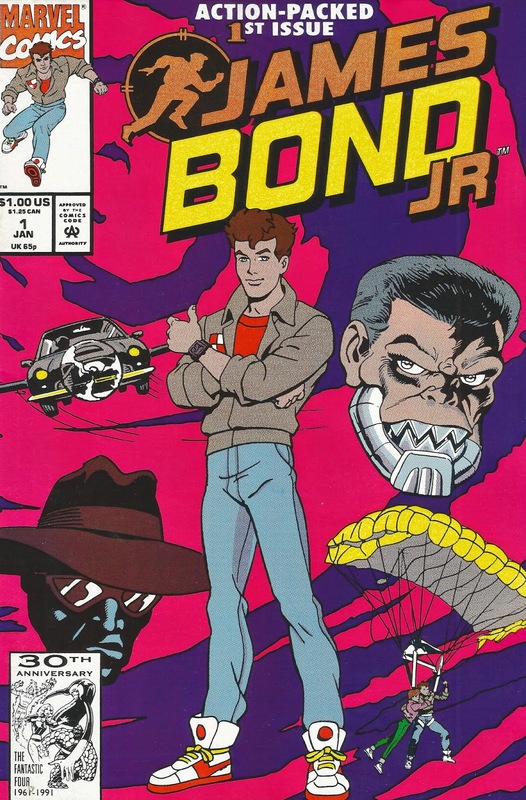 I didn’t draw anything in this comic book, by the way, but there’s almost NO images of James Bond Jr. from the TV series online. It’s THAT forgotten by history. Such a proud moment in the career, that was. For last week’s Mohammed-Drawing moment of courage, click here for the Je Suis Charlie Bun Toon of last week. 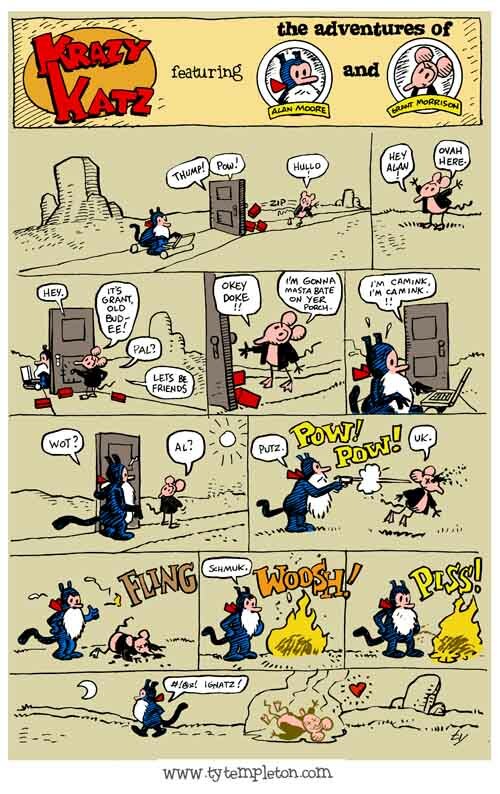 …Pour Mohammed-dessin le moment de courage, cliquez ici pour le Je Suis Charlie Bun Toon de la semaine dernière. Happy New New Year Bun Toons! YAY! Happy New Year everybody (he said, knowing it isn’t)! Wasn’t last night a blast (probably not)? It’s OFFICIALLY the first of the new year, here at Bun Toon Central, and time for the Most and Least Popular Bun Toons of 2014 to be revealed. Our champion of the year was read by far, far more folks than possibly any Bun Toon of all time. There’s almost no way to tell. Normally, I use the local webcounter here, and tally up all the links back to determine how many eyeballs landed on my humble bunny funnies, but this little viral monster ended up everywhere online, on everyone’s ELSE’S tumbler, on their website and eventually onto the printed page as a poster (available exclusively at Reno’s Wizard World Comic Convention last year!). I can’t count up other people’s tumbler numbers, and couldn’t even guess at how many people lifted this Bun Toon whole cloth, so we’re just going to say “lots and lots” and leave it at that. But who can read that lettering? Best parts of crusading for Bill The Boy Wonder last year: Creating awareness of his story, and getting to talk to his granddaughter Athena Finger. 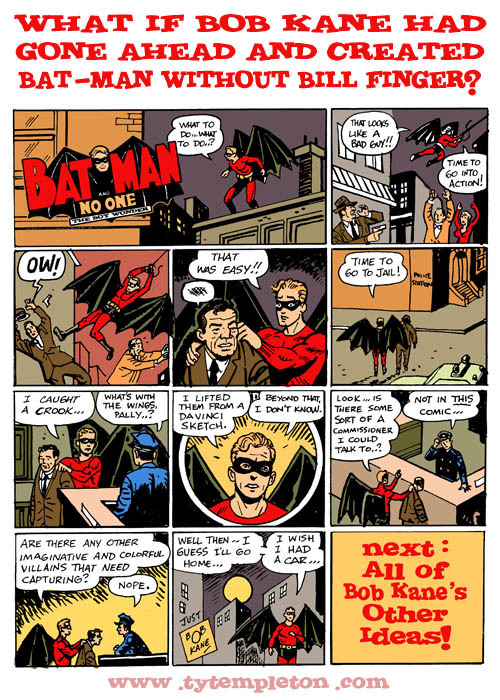 The tide is starting to turn towards justice for Bill’s place in history: If you go to Batman’s wiki page, it says co-created by Bob Kane and Bill Finger nowadays. It’s only DC Comics that can’t admit it, but the part of fandom that isn’t controlled by an iron-clad legal document that keeps Finger from getting his due credit, is happy to embrace Batman’s other papa. Finally. 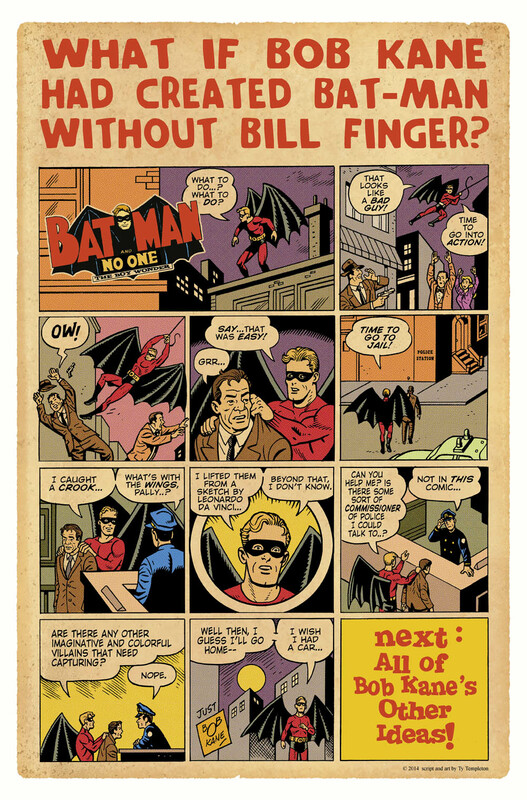 Batman fans have been given the Finger. When they decided to kill off Wolverine, right after bringing Peter Parker back from the dead, slightly after the return of Jean Gray, but after the murder of Professor X, which was followed by the return of Nightcrawler…I started to think there was no choice…at least if I wanted my Bun Toons to catch on. That’s Ortiz, the Hispanic Pool Boy in the last panel, a beloved ethnic slur that showed up in the strip a few times over the summer. He wasn’t popular either. That strip up there was only the SECOND least read Bun Toon of the year…the honour of being dead LAST was earned the very next week when I decided to keep up with this silly Dead Bunny Saga…and NO ONE showed up to play along. The Pepsi drinking version of the Bunny (with the backwards signature on his shirt) hosted Bun Toons for the rest of the summer, but I quickly stopped making reference to his being an evil twin as no one seemed to notice or care. Eventually, I simply put the signature on the shirt the right way ’round again in September, and the readership boycott drew to a close. I thought it was a funny “take” on the industry’s fondness for slaughtering its heroes, but I’ve never been so wrong in my instincts before. Which means, the epic, twenty-eight part “Return of the Bunny” will never see the light of day. It’s a pity, because I would have brought back the Watcher, Gwen, Jor-El and Lara, and Jack Kirby in successive chapters. See you NEXT week for the start of Bun Tooning 2015! (No entry tomorrow, I don’t want to overstay my welcome with six Bun Toons in a row!) What’s coming up will surprise you, because it will surprise me. I never know what these little stories will be about until Saturday morning. Ty the Guy OUT for 2014! Just a Second Bun Toons! YAY! Normally my #1 Bun Toon of last year comes on the FIRST day of the new year, but yesterday, essentially without warning, I was whisked away in a car with my wife and children to a town far far away from my home for a larger family gathering of my wife’s brother/sister/mother peoples. Delightful time was had by all, and many of the family are still there as I type this…but as for me, I was delinquent in yesterday’s Bun Toon entry for reasons of merry making, family and good will to all. So there. As a result, I’m dragging the New Year out for one more day in my virtual reality Bunny World. How can that be a bad thing? You get to get blind drunk again, as we all get to look at the SECOND most popular Bun Toon (and the nearly least popular Bun Toon) of 2014 on this, not really New Year’s Day. 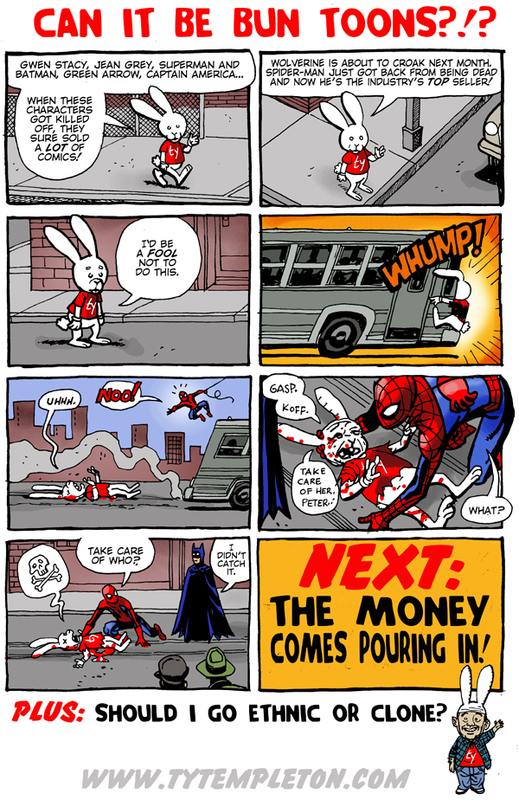 This Bun Toon was shared, and clicked, and linked to, and posted all over the interweb when I put it up this summer, and I’m going to assume it was the free publicity that it generated for the movie that made Guardians into last year’s runaway hit film. Marvel has yet to thank me. 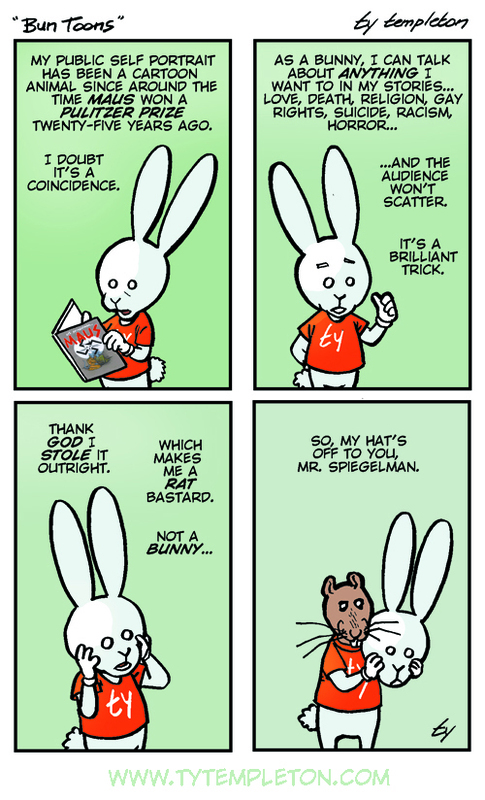 I also rescued Constantine from cancellation last fall with the following Bun Toon, done in a similar vein. Ah, the power I have over Hollywood. He started smoking on the show the very next week…. Now for another Bun Toons From The Dustbin of History. I told you. No exploding cars – That was the problem. But I was IN a car with the wife and kids yesterday, which is why you didn’t see this Bun Toon when you were supposed to. See you guys tomorrow for NEW NEW YEARS DAY! YAY! Seriously, I’m keeping up the lie.